WTI trades above the $57 level for the first time in over a week during early Tuesday session. 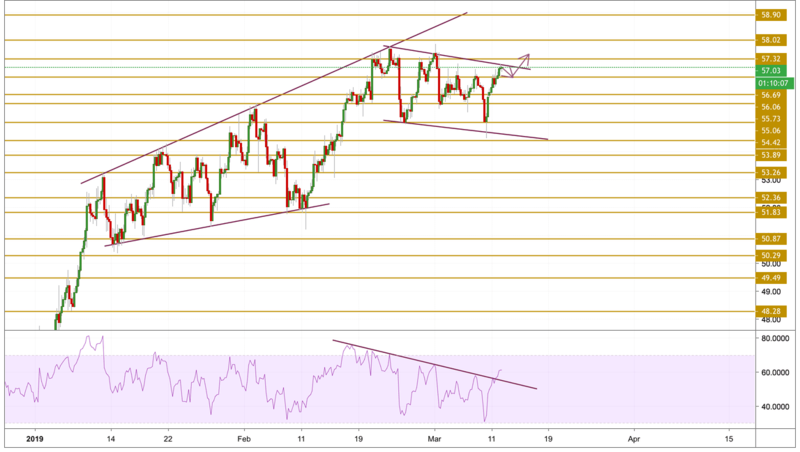 The energy benchmark gained traction as weekend comments from Saudi Arabia seems to prove right after recent statements from the OPEC secretary. The cartel authority said that the on-going supply adjustments will continue through 2019 and the rebalancing of the global oil market is a work in progress. Energy traders may now await weekly inventory details from API and EIA in order to determine near-term trade direction. Crude oil prices surged during yesterday's session,climbing above the $57 level for the first time in a over a week. The break above the $56.7 resistance level triggered the upside move and now the price is currently, like expected, testing the upper band of the channel and looking to the breakout above it. We will be focusing on the $57.32 resistance level.